If toxicity is a problem, for example, due to high metal or sulfide concentrations, or if the substrate is too poor in nutrients or in water retention capacity, it will not be possible to implement successful remediation without significant amendments. These may include enrichment of the substrate with organic matter, addition of pH buffering substances such as limestone, or covering the mine wastes with a thick layer of topsoil. Because in many cases large areas have been impacted by mining, the amendments may make dryland remediation very expen sive. In addition, unless the toxic materials are removed or covered under a very deep layer of topsoil, the resulting ecosystems are likely to be impoverished - lower in bio diversity and less valuable in terms of ecosystem services - compared to the situation before mining commenced. Provided water is available, wetlands may be a more attractive alternative. While dryland areas in mining impacted areas may remain devoid of vegetation for very long periods of time, in many cases new wetlands have formed spontaneously on mine sites. In such cases the vegetation has often formed a significant layer of organic matter. Why wetland plants are able to establish on relatively toxic mine wastes is not fully understood, but one reason may be the tendency for wetland condi tions to buffer pH, while another may be the tolerance of wetland plants to the conditions that are toxic to most dryland plants. The constitutive tolerance of wetland plants to metals in the substrate means that selection of metal tolerant populations for active remediation, as has been the approach for dryland remediation of metal mines (F. rubra Merlin is an example), is not necessary, because plants from any population can be used, regardless of origin and history of exposure to metals. This does not necessarily mean that wetlands can be established on mine wastes without amendments. Low level amendments, for example, the addition of some limestone when acidity is a problem, may speed up the process of establishment of the vegetation. Still, in many cases wetlands may be a better option for reme diation than drylands. Due to the low oxygen permeability of water, water logged sediments are typically anaerobic and in a chemically reduced state. The chemically reducing con ditions are due to anaerobic bacteria that oxidize organic matter while reducing a wide range of substances that are used as terminal electron acceptors. For example, if the redox potential is low enough, iron will be reduced from its ferric Fe(III) form to its ferrous Fe(II) form, while at even lower redox potentials sulfate will be reduced to sulfide. In turn, sulfides bind to metals and metalloids, rendering relatively insoluble compounds. The soil pH is also buffered under typical wetland conditions. Upon flooding of an acid soil the pH tends to increase toward neutral, due to the consumption of protons by reduction processes, particularly iron reduction. However, upon flooding of an alkaline soil, the pH decreases toward neutral due to the dissolution of carbonates. This means that the biogeochemical conditions of wetland soils favor immobilization of sulfate and metals and their removal from the overlying water, decreasing their availability for leaching and uptake by organisms. The processes described above occur in many wet lands, but certainly not under all conditions. Substrates that are highly permeable and saturated with oxygen rich water, for example, Sphagnum bogs or the bottom sedi ments of fast flowing streams, will never become anaerobic. Strongly reducing conditions require sub strates that have relatively low permeability, as well as organic compounds available for oxidation by micro organisms. Buffering of pH requires the presence of the substances that drive the reactions, including Fe in acid systems and carbonates in alkaline systems. These con siderations must be taken into account when creating wetlands for remediation of mine areas. The presence of plants is required to enhance and maintain the presence of organic substances to drive the crucial microorganism mediated redox reactions. 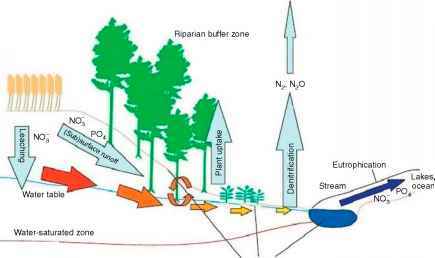 However, wetland plants are also known to mobilize metals in the rhizosphere. The adaptations that make it possible for plants to grow in the anaerobic, chemically reduced substrates - radial oxygen loss to the rhizosphere and the support of oxidizing bacteria through exudation of low molecular weight organic acids - may lead to a lowering of the pH, the oxidation of sulfides and iron, and subsequent dissolution of associated metals. Does that mean that the presence of plants can lead to mass mobi lization of metals? Probably not. Evidence exists to show that wetland plants can indeed mobilize metals from mine wastes, but there is no record of a situation where this occurred at a scale that outweighed the metal immobiliz ing capacity of wetlands. In addition to stabilization of solid mine waste, wet lands can also be used for the treatment of mine water. In this case, other mechanisms in conjunction with the processes described above contribute to the removal of pollutants, such as adsorption to soil particles and organic matter (particularly metals), uptake by plants, and volati lization from the substrate and water (e.g., sulfur and mercury). Combinations of wetlands can therefore be used for the complete remediation of mine areas - as a cover over mine wastes as well as for treatment of excess water and leachate from wetland covered wastes. Generally, wetlands can be used for remediation of a wide range of mine wastes: while they can prevent and buffer acid mine drainage, they also immobilize metals and metalloids. Worldwide, wetlands are being used for remediation of lignite coal and metal mine wastes includ ing radioactive wastes from uranium mining. Of course, this is all possible as long as there is enough water available.